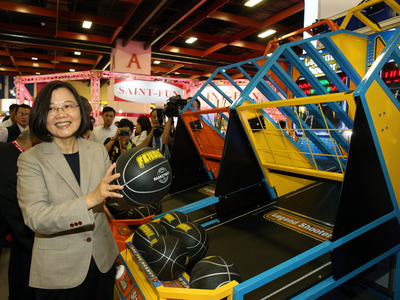 Taipei, March 23 (CNA) The ruling Democratic Progressive Party (DPP) will postpone its process for nominating a presidential candidate by a week because President Tsai Ing-wen (蔡英文), who intends to run for re-election, is currently on an overseas trip. Tsai, who has fared poorly in recent opinion polls when matched against potential 2020 election opponents, is being challenged for the DPP nomination by former Premier Lai Ching-te (賴清德). DPP Secretary-General Lo Wen-jia (羅文嘉) said Saturday that if a solution to settle the issue through negotiations is not found by April 12, a primary based on opinion polls will be initiated. Lo said a policy platform presentation could be broadcast on TV on either on April 13 or 14 and opinion polls would be conducted between April 15 and 17, meaning that the results could be available April 17-18 and a nominee could be decided by April 24. Lai said Saturday that he respects the DPP's decision, while the party said it has not informed Tsai because she is currently visiting Taiwan's three allies in the Pacific. Meanwhile, the opposition Kuomintang (KMT) continued to struggle to settle on a way to choose its presidential nominee, with candidates questioning the fairness of the selection process. Asked if the KMT will directly recruit popular Kaohsiung Mayor Han Kuo-yu (韓國瑜) to run in the primary, KMT Chairman Wu Den-yih (吳敦義) said Saturday that a consensus for such a move has emerged among party members. A practical way could be that Han "passively" accepts the call to run and has somebody register him for the primary, Wu said. However, former New Taipei Mayor Eric Chu (朱立倫) and former Legislative Speaker Wang Jin-pyng (王金平), who are both vying for the KMT's presidential nomination, questioned the credibility of the selection mechanism, saying it has changed three times in a month. "How can a pitcher pitch if facing an ever-changing strike zone?" Wang wrote on his Facebook page to describe the situation. Chu said that whether a candidate is "passively" recruited to register or registers out of their own volition, they still have to participate in a primary. The KMT said previously that it had decided to retain its usual primary process for a presidential candidate, in which public opinion polls will count for 70 percent of a candidate's rating and a vote by party members will account for the the other 30 percent. But facing calls to enlist Han, Wu later said the party will preserve the possibility of calling up Han even if it is a one in 10,000 long shot. Meanwhile, asked about his intention to run in the presidential election, Han reiterated Saturday in Macau that "I'm not thinking about it at the moment."